If you wake with a sore neck or shoulders, suffer with headaches or lower back pain, this organic buckwheat husk pillow is very likely to relieve or reduce your symptoms significantly, if not completely! You can find lasting relief from sleeplessness, neck and back pain, headaches, snoring, muscle tension, TMJ (Temporomandibular joint) syndrome, and other posture related discomfort with your buckwheat pillow! Used around the world for centuries, and recommended increasingly by health professionals. Most say they sleep better, are more comfortable and wake up more alert than they ever have before. Ideal for side-sleepers - large enough to mould around your neck providing added support. Long lasting and eco-friendly – with a life expectancy of up to 10 years, its one of the best value cervical pillows on the market. When you are finally ready for a new one you can discard your husks on the compost heap – this will happen long after other pillows have collapsed and worn out! Made in New Zealand using clean high-quality Certified Organic Buckwheat Husks encased in 100% unbleached cotton. Care: To increase the lifespan of your Pure Earth pillow, please read the care label before use. We recommend laundering in cold water and using eco friendly products to keep your fabrics and our earth pure. Keep reading for more Q&A on Buckwheat husk pillows below. What are buckwheat husks and why do they work for a pillow? Despite what it’s name suggests, buckwheat is actually a fruit related to rhubarb, not a type of wheat, cereal or grass. Grown inside the husk, buckwheat kernel or groats is a highly nutritious food, the dried fruit can be eaten whole or ground into flour. 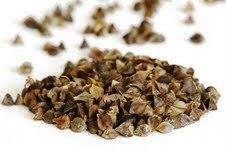 Buckwheat husks are the shells that protect the buckwheat kernel from various elements of nature. These husks are cleaned with air and sifted to remove debris and dust so they can be used as pillow fill. The slightly curved shape of the husk segments tend to interlock together when used in the thousands as a pillow fill, enabling them to hold their shape without collapsing or bouncing back like other fills such as polyester, foam, or feathers do. Why are buckwheat husks great for a therapeutic pillow? The natural filling has many advantages over synthetic fillers like foam, polyester or feather fillings. The most important quality for the relief of pain is that the material conforms to the exact contours of the head and neck providing support. This means that you have the same amount of support in all areas, minimizing stress on the body. Other filling materials which compress, try to recover their original shape and this puts stress on the muscles of the neck. Most of us spend 6 to 8 hours a night sleeping, that’s an average of 2,500 hours a year! To be able to sleep in an anatomically correct position is extremely beneficial to our whole body. With a buckwheat husk pillow, you will find relief from sleeplessness, neck and back pain, headaches, snoring, muscle tension, TMJ syndrome, and other discomforts. All this combined with the thermodynamic nature of the pillow, which keeps your head at a constant normal temperature, means substantially less tossing and turning. Many people report waking up in the same position they went to sleep in. Most say they sleep better, are more comfortable and wake up more alert than they ever have before. How do Buckwheat Husk Pillows help neck pain and muscle tension? When sleeping on a buckwheat husk pillow, all the muscles and tendons are relaxed and in their preferred position of proper cervical curve (normal cervical lordosis). The interlocking of buckwheat husks support the entire head and neck area uniformly. With foam and polyester pillows (even those designed to be 'cervical' pillows) there are always areas of the pillow that are more compressed than other areas, which forces your muscles to fight back against the pressures. When you relax the shoulder and neck muscles during sleep, it lets the nerves relax and heal from the daily irritation of head, back and arm movements. Buckwheat husk pillows can be customized by adding or removing buckwheat husks to provide the perfect level of support for your own body. Adding or removing husks gives us the ability to adjust the quantity of pillow filling to meet your exact requirements. Please contact us if you would like to add more husks to your pillow. How do Pure Earth Buckwheat Husk Pillows help relieve headaches? The Pure Earth buckwheat husk pillow tends to lower blood pressure, which is a major cause of stress related headaches. Because your neck is better supported, the muscles are not in a constant state of contraction, and are not having to work through the night. Your head is also in a better position to alter the angle of the throat which improves airflow. So because your muscles are relaxed, and receiving better oxygen, your blood pressure is lowered and stress is relieved. How do Pure Earth Buckwheat Husk Pillows help reduce snoring? The Pure Earth buckwheat husk pillow can reduce or eliminate snoring in about half of users. The people who are not helped through using a buckwheat pillow may have more serious problems, such as sleep apnoea, and are strongly urged to see a qualified health professional as soon as possible. How do Pure Earth Buckwheat Husk Pillows help TMJ (Temporal Mandibular Joint) problems? The more relaxed the neck and shoulder muscles, the easier it is for the smaller jaw and facial muscles to function properly. How do Pure Earth Buckwheat Husk Pillows help sleeplessness? When you lie on a Pure Earth buckwheat husk pillow and let your muscles relax, you tend to fall asleep faster. Many people say that they wake up in the same position they fell asleep in and didn't move all night. You may even find that you wake up more refreshed and alert. There is some speculation, however not tested or confirmed, that resting your head on natural buckwheat husk pillows will induce more lucid dreaming while using the pillow. The pillow will conform to the contour of your neck as you move around during the night, providing continual support. The pillow is also good for people who never use any pillows because most pillows provide too much support lifting your head too far off the bed, but the Pure Earth Buckwheat husk pillows let your head rest close to the bed. Buckwheat husk pillows seem noisy, will that affect my sleep? Some people are concerned about the noise a buckwheat husk pillow makes however, once you get used to the pillow your brain overrides the noise due to the comfort level of the pillow and the fact that you are able to fall into a deeper, more settled sleep. Many report not being able to sleep without the soft crunch of the husks under them after sleeping on them for a night or two. Used in conjunction with the Pure Earth Bamboo Fleece Pillow Protector, the noise is automatically reduced and comfort level increased. How Long Does a Buckwheat Husk Pillow Last? Do the Husks Wear out or Crumble? Pure Earth Buckwheat Husk Pillows should last about 10 years or even longer depending on how you care for your pillow. The husks do not break down or wear out, but they do become polished with use. As the natural texture of the husks become polished the pillows actually work better than new because the husks move and conform to your contours easily. If you ever do need additional husks, they are available for a nominal charge. How can I increase the life span of my Buckwheat Husk Pillow? Please place a pillow protector or pillow case over your Pure Earth buckwheat husk pillow to help protect your pillow from any moisture and hair oil. Ideally put your pillow out in the sun at least once a month to air out and freshen up. I’ve heard about Heating or Cooling Buckwheat Husk Pillows, is that helpful? Please note: These pillows are not “wheat bags”, their primary purpose is for sleeping and not as a heat/cold pack. Heating the pillows is possible but we do not recommend it because it can reduce the moisture content of the husks and is potentially unsafe. We suggest extreme caution if you ever plan on heating any natural grain pillow. How can I clean my Buckwheat Husk Pillow? We do not recommend cleaning the husks. The pillow casing will rarely need cleaning, but when it does simply remove the husks from the zippered opening and wash the liner in warm water and hang to dry. Replace the husks when the cotton casing is completely dry. I’m Allergic to Wheat and Grain, Can I use Buckwheat Husk Pillows? Buckwheat husks are not a grain like wheat, they are a fruit. Husks are hypo-allergenic and very few people are allergic to buckwheat husk pillows. Statistics state that about one in six thousand people can’t use the pillows because of their allergies. This may be actually related to the tiny amount buckwheat flour residue. According to studies about 1 to 5% of the population may be allergic to the proteins in buckwheat flour, these husks go through a double-cleaning process, which removes virtually all of the buckwheat flour from the husks. If you notice any allergic reaction such as itchy throat, watery eyes, runny nose, etc. discontinue use of the pillow. Please report any reactions to us. Buckwheat flour residue in un-cleaned husks may have a higher risk of allergic reaction. Can Children use a Buckwheat Husk Pillow? Newborns, and infants under 4 months old must never use ANY pilow due to increased risk of SIDS (Sudden Infant Death Syndrome). Although you can breathe straight through buckwheat husk filled pillows, the Carbon Dioxide concentration can increase causing risk to infants. Young children under about 11 years old should use their appropriate size of buckwheat husk pillow and with careful adult instruction on the proper use, making the hollow area for the head and keeping the pillow close to the shoulders. Children prone to pillow fights should not be given access to these heavier than normal pillows. Can I use a Buckwheat Husk Pillow on a Waterbed? Buckwheat husk pillows work great on waterbeds. They provide a similar type of shaping to your body that the waterbed does. The light airy husks keep your head from overheating from the heated waterbed. Does a Buckwheat Husk Pillow ever get Bugs/Mites/Fungus? The husks are what provide the natural protection to the buckwheat kernel from natures invading organisms, and since they are a fibre, they are not nutritive. It is unheard of for any of our pillows in regular use to ever get any infestation. Any natural pillows kept in storage for long periods of time that are not in use may provide a habitat for any number of organisms, therefore if you are going to store a pillow for long periods of time it is recommended to keep the pillow in a freezer at least for one day per month as a preventive measure, especially if you live in a hot and humid environment. Alternatively, you may use a vacuum pack sealing system. This is preferable to adding chemical agents to the pillow. We believe that people should not be exposed to chemicals when they are sleeping. Most synthetic fibres like polyester, foam and feather pillows have formaldehyde, UV inhibitors, anti-fungal agents, stabilizers, plasticizer, etc. added. There are no chemical additives used in the growing of husks for our pillows, and the only cleaning agent used is air.